Even among Rolex enthusiasts, the Cellini is an often overlooked and misunderstood watch collection. Cellini is not a separate company from Rolex but rather a distinct range of high-end dress watches that sits outside of the better-known Oyster Perpetual lineup. Cellini watches are not Rolex watches that can go scuba diving, climb mountains, or time high-speed car races. Instead, these are classic timepieces in the most traditional sense of the word. In 2014, Rolex revamped the entire Cellini collection with a host of new timepieces and continues to add new models each year. These are not the Cellini watches of past generations, which were often manual-wound or quartz-powered, and overdesigned. The modern Rolex Cellini watches are refined, elegant, and automatic. 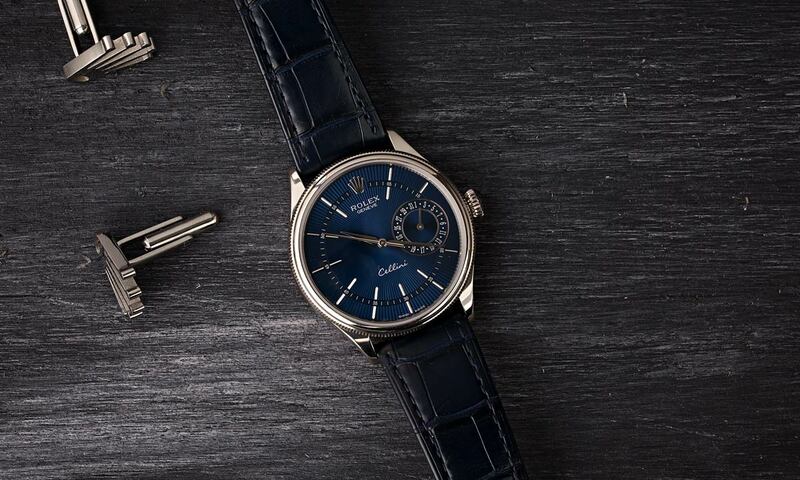 One of our favorites right now is the blue Cellini Date ref. 50519. Let’s find out more. 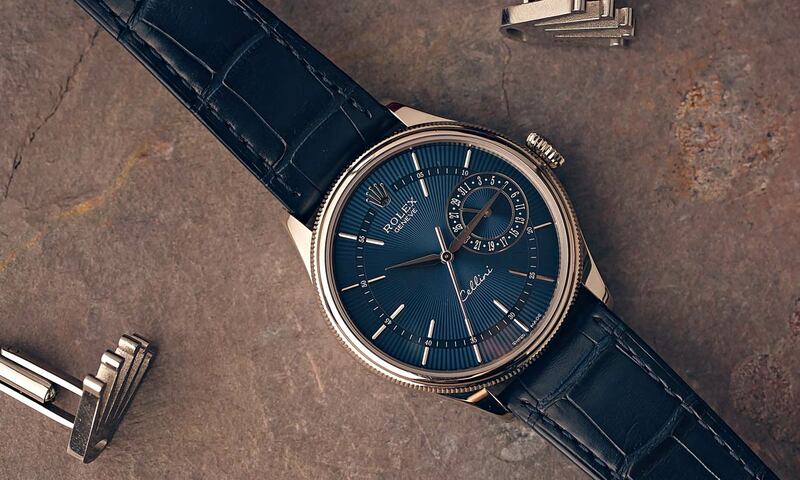 The Rolex Cellini 50519 is a beautiful watch for its newfound aesthetic by Rolex. Modern Cellini watches are exclusively crafted in 18k gold and the Cellini Date ref. 50519 is a white gold version with a round 39 mm case and slim profile. The watch includes an intriguing double-style bezel, bringing together an interior smooth bezel surrounded by a decorative fluted bezel. Plus, to match the fluting on the bezel, the guard-less flared winding crown also features the familiar pleated texture. Moving onto the dial, we see a continuation of the fluting motif by way of an intricately guilloché surface. Blue is a great dial color choice for the Cellini Date ref. 50519 since it adds some vibrancy to the timepiece, yet is still considered neutral enough to wear every day. The Cellini Date features a playful take on the vintage-inspired sector style dial with its applied white gold hour markers divided by an inner minute track ring. Also, rather than a simple date window, the Cellini Date includes a date subdial at 3 o’clock with great effect. To match the blue shade of the dial, this Cellini Date ref. 50519 comes fitted with a handsome blue leather strap attached to the elegantly tapered lugs. To secure the watch around your wrist, there’s the white gold tang buckle topped with the Rolex coronet. Often times considered the most underrated watch from Rolex, but the Cellini still holds it ground. The audience for the Rolex Cellini 50519 has grown since its redesign. Although the Cellini Date does include a screw-down winding crown and a fluted caseback similar to Oyster Perpetual watches, water resistance rating is half the OP minimum at 50 meters. After all, this is not the timepiece to bring to the pool, shower, or beach. Beneath that solid caseback sits the in-house Rolex Caliber 3165—a self-winding movement exclusive to the Cellini Date collection. This COSC-certified chronometer operates at a frequency of 28,000 beats per hour and offers a 48-hour power reserve. With time-honored horology traditions like guilloché decorative techniques, a restrained case size, and the use of precious metals, the modern Rolex Cellini line is assertively going after the formal dress watch category by competing with the likes of the Patek Calatrava, the Vacheron Patrimony, and the Piaget Altiplano. And if Rolex continues to release models as appealing as the Cellini Date, it won’t be long until the currently overlooked Cellini gets its well-deserved moment in the spotlight.